The Netherlands is known for precise management of sea and lakes, dazzling architecture, and yes, cyclists. 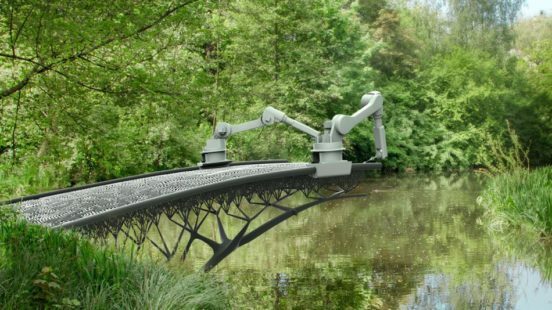 Now it is set to open an attraction melding all three of these competencies: the world’s first 3D-printed bridge. The concrete bridge is meant to be used by the country’s rabid cyclists. Dutch officials wearing hard hats were the first to use the concrete structure, riding their bikes across the bridge in the southeastern town of Gemert earlier this week. Theo Salet, a professor from the Eindhoven University of Technology, observed “The bridge is not very big, but it was rolled out by a printer, which makes it unique.” Salet was speaking to Dutch broadcaster NOS. 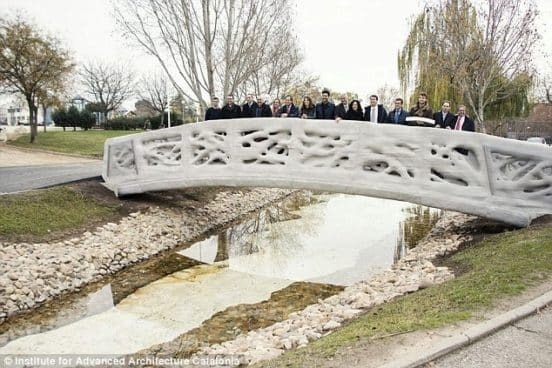 He noted the bridge has 800 layers and that the total printing process took about three months. It is constructed from pre-stressed, reinforced concrete, according to Eindhoven University spokespeople. 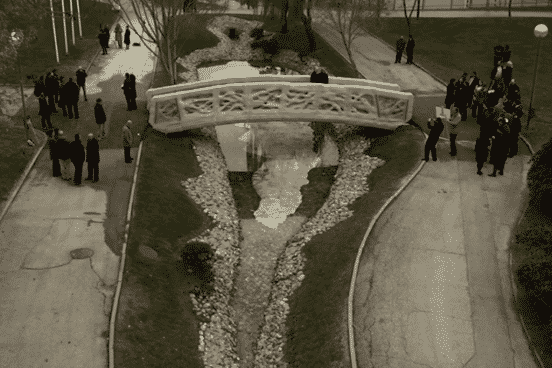 The bridge is eight meters long (26 feet) and it goes across a ditch containing water, thereby connecting two roads. The BAM Infra construction company tested the bridge for safety to make sure the bridge could bear loads up to two tons. The load-bearing capability is extraordinary, amounting to about 40 trucks. Such sentiments are common in the Netherlands, where concern for the whole mixes with a deep practicality. The 3D printing experiment meant that the country needed fewer scarce resources, plus it generated significantly less waste, according to Schimmel. The Netherlands, along with China and the USA, are among the early leaders in 3D printing, a cutting edge way of using robotics and computers to design almost anything and produce prototypes and objects quickly. In 2016, a Dutch architect made his own 3D printer that he hopes will construct an “endless loop” building. Dutch start-up MX3D looks to be next in devising an unusual solution for bridge design. It has started printing a stainless steel bridge. The bridge is already nearly halfway complete. The goal is to put the bridge in Amsterdam, over a canal in June of next year. The MX3D bridge will be 12 meters long. It is being printed in the location by robots. The steel bridge will also be embedded with sensors which will collect all sorts of data on measurements and the environment, such as vibration, strain, displacement, air quality and temperature. This should result in a bridge which can be monitored by engineers in real time, which should increase its lifespan.